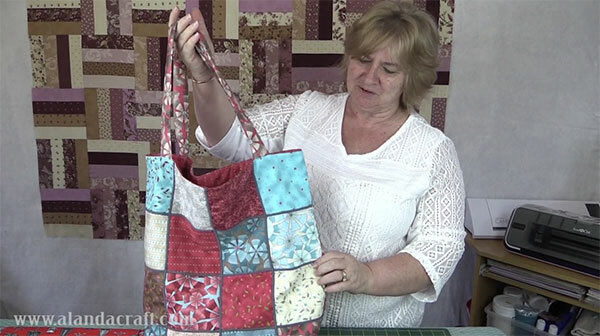 To make this couched patchwork tote bag I have used a Moda Charm Pack. I love using 5″ squares to make bags. Everything is precut and you don’t have to think to hard about matching fabrics as it’s all done for you. 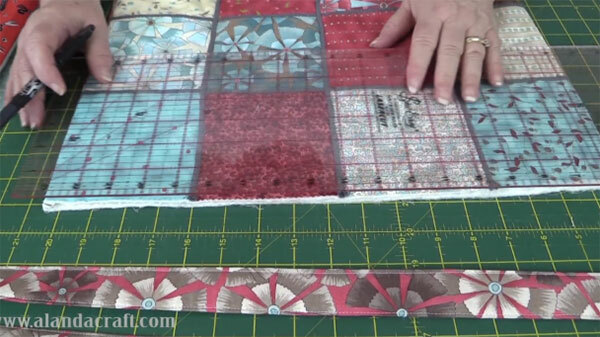 That is of course, if you are using Moda Charm Squares or another brand of precut squares. 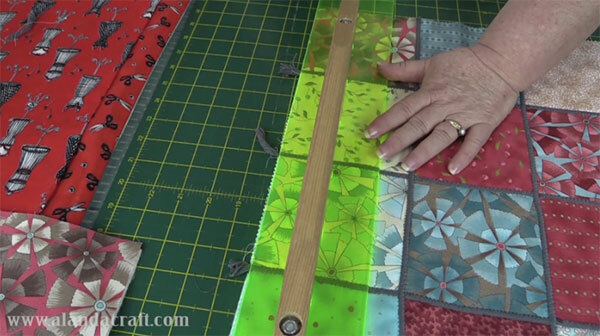 However, for this tutorial you could cut also your own. I have used Suzani by Michelle Marvig for George Parsons. I just love the colours. And there are so many lovely charm packs available so we are really spoilt for choice. You can find a range of Moda Charm Packs at Fabric.com and Amazon also have a wide range. 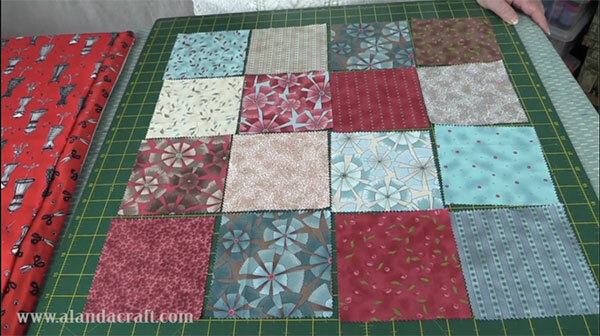 Note: You can scroll down to the bottom of the post to see the video tutorial for this project. 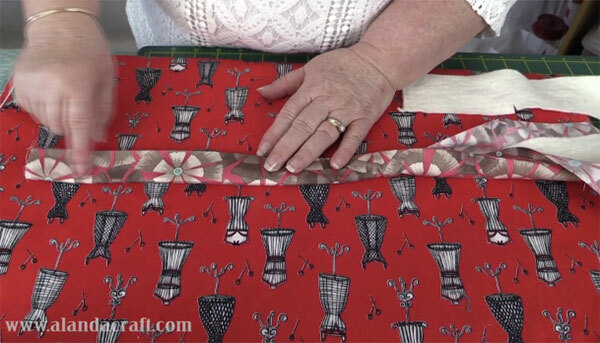 2 pieces of fabric measuring 5″ x 22″ or the length you want for your handles. Press the seams in opposite directions for each row, as pictured above. Add batting to back of main piece and wrong side of back piece. Put backing piece aside. 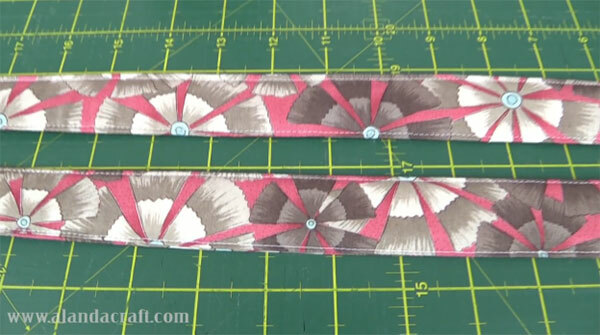 On a piece of scrap material test the size of your zig-zag stitch. You want it to go right across the yarn and not split it. 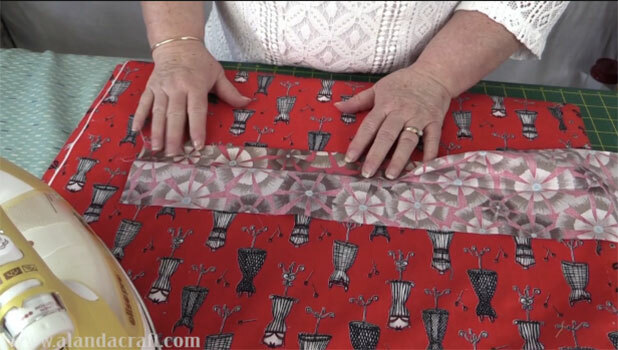 When you are happy with the width of your zig-zag then you are ready to attach the thread to the seam lines of your squares. We sew the thread across all three rows then turn the bag and couch down the other three rows, just running the thread over top of the thread you have laid down previously. 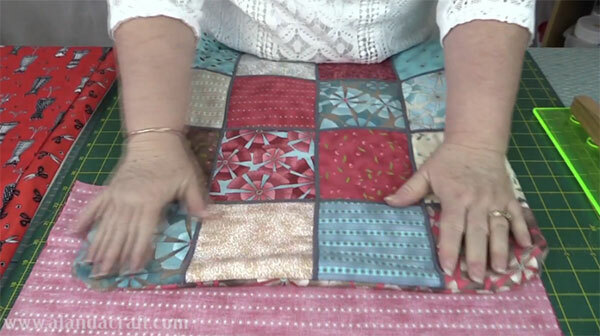 Place the main piece and the backing right sides together and sew around 3 sides with a ¼” seam. Leave the top end open. Backstitch at the start and the end. Turn bag to right side. Put aside for now. 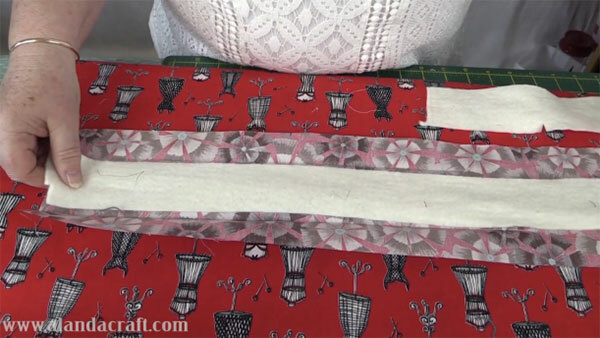 Take your two lining pieces and join them on 3 sides using a ¼” seam allowance. I wanted a four inch base on this bag so I measured down 2″ from the base of the ‘V ‘at the corner where the bottom and the side seam meet. 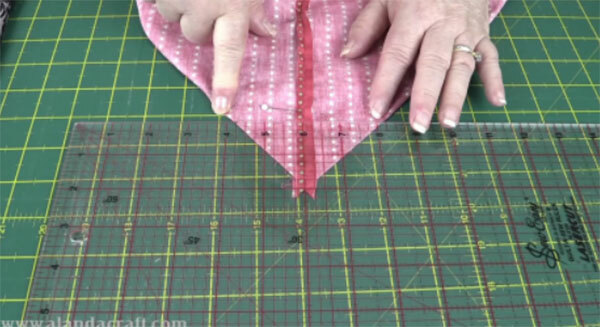 Make sure the bottom and side seams line up perfectly as you want to have a continuous look to your seam line when you finish. 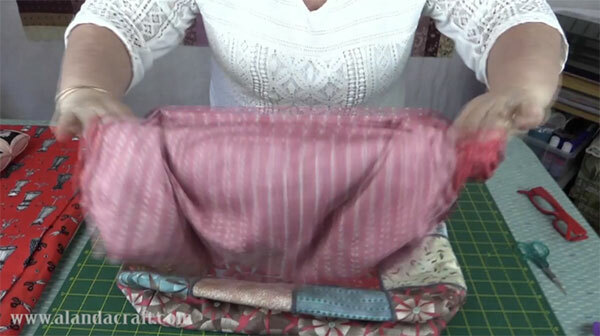 We have a tutorial on “How to Box Bag Corners” where you can see this process in detail. 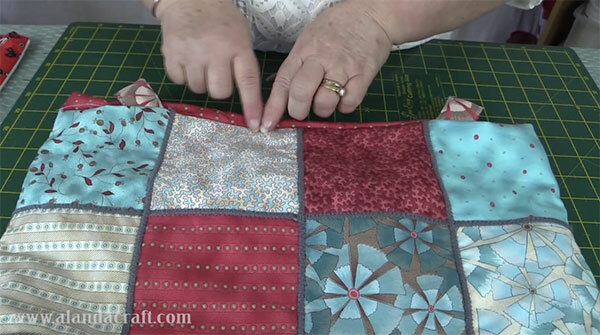 You need to box all four corners – 2 on the lining and 2 on the main piece of the bag. 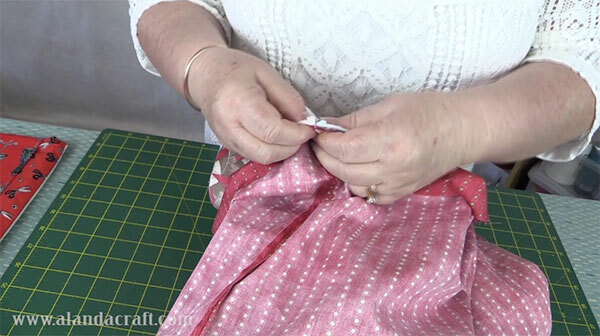 Trim the excess fabric from the boxed corner when you are happy that the seams line up. 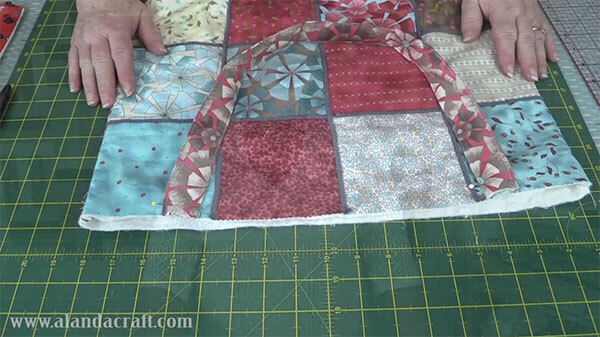 Leave about a ¼” seam. Put all the pieces aside and make your handles. Open out and lay your batting down the middle. Fold the edges back into the middle over the batting. Topstitch down both sides of handle ⅛” from the edge. 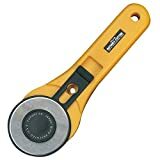 Measure in 4″ from each side seam and draw a small line with a water erasable or Frixion pen. Pin the handles in place, with one side on the mark you have just drawn. 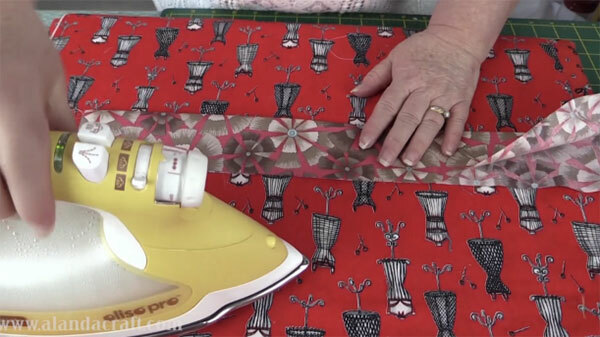 Make sure they are not twisted and pin with the bulk of the handle out towards the side seam. I like to stitch them in place before adding the lining so that they don’t move and I know that they are sitting correctly. Turn the lining inside out and place the bag inside the lining so that the right sides are facing. Make sure the handles are pushed down towards the bottom of the bag. We don’t want to catch them up in the seam we are going to sew around the top. 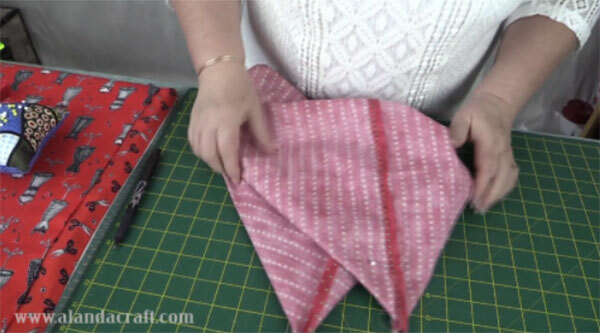 Give the bag a bit of a shake (hold on to the top edge), you want the whole thing to lay relatively flat. 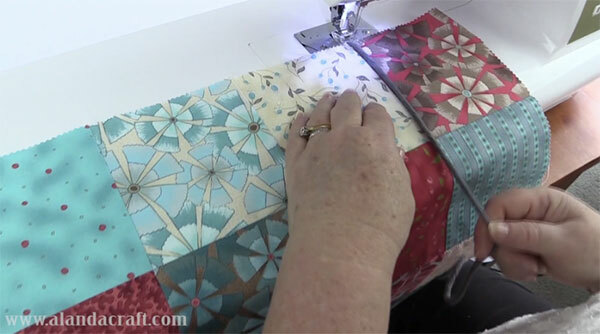 Pin the two pieces together and join with a ¼” seam. Make sure you leave about a 4″ to 5″ opening on the back side of the bag so that you can turn the bag through once you have sewn it together. Turn bag through. Push lining to the inside of the bag. Make sure it’s nice and neat by giving it a bit of a press. Topstitch around the top of the bag about ⅛” from the edge. 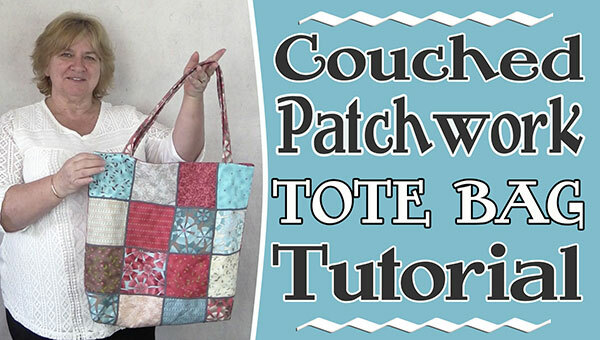 And here we have it – our couched patchwork tote bag is finished. Don’t forget to check out the video for the full instructions. You are so helpful and I love all that you share. May you have a Blessed Thanksgiving and Christmas Holiday. Thank you so much for your lovely comment Janet; and a happy Thanksgiving and Christmas to you and your family. Thank you so very much for your time and effort in explaining how to do these lovely totes! These will make lovely Christmas gifts for sure. 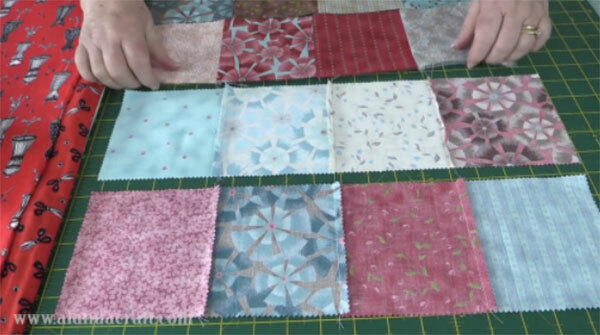 You are such a wonderful teacher, I am new to quilting but am excited to see more of your videos. Once again, thank you! Thank you so much for your lovely comment Linda. These totes are so quick and easy and will make really lovely gifts. This was so much fun that I’ve made three totes this weekend! Thank you ever so much…. That’s great to hear Mindi. It’s amazing how creative you can get using different threads to couch with. Awesome tutorial. Cute,Cute,Cute. The couching realoly makes this bag. Is there something else you can use for the couching besides yarn? I am not a knitter so I don’t have scraps of yarn. Is this wool yarn? I’ve never use daily this. Do I buy it where they sell yarn? Yes we have used wool. You can use any fibre medium as long as it is quite thick otherwise it will meld into the background and you want something that stands out. You could even use rope as long as its not too thick. Yarn is available in most haberdashery stores or online – eBay, Amazon. The only thing with buying online is that you won’t be able to gauge how thick it is. Depending on where you live, you will find wool at Joann’s, Walmart etc. Excellent tutorial. You made it look very easy. Thank you. What happened to step 7? I do not see it. The steps were mis-numbered, I have fixed it now. Thanks for letting me know. Thank you Joe. We would love to see some photos of your finished bag. Here is a link to our ‘Submit Your Project’ http://www.alandacraft.com/submit-your-project/ if you would like to share some photos on our Readers Project page. It’s always interesting to see how different each project turns out. After you have sewn the squares together, Betty. Just check Step 5 “Couching” in the written tutorial.